After a long winter doing “spinning sessions” at his local gym (not daring to embrace the English winter on a real bike!) the time has come for the outdoor challenge! Alex will follow the ‘Tour de Yorkshire’ route over 3 days, commencing 14th August 2015. 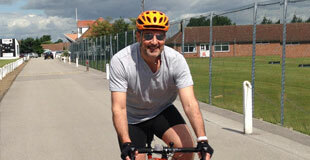 He will cover 170 miles supported by experienced cyclist friends. Mentally Alex is ready, just hope his body is! Please follow the link click HERE and donate what you can to ‘Children with Cancer UK’ JustGiving. Alex has chosen to support ‘Children with Cancer UK’ as he and his family have seen how this nasty illness indiscriminately devastates the lives of people and their families. It is particularly unfair that a child / young person is deprived of the right to a happy and healthy life. UPDATE: Well done to Alex, his Tour de Yorkshire Route Challenge raised £360 for Children with Cancer UK.